Acting in the superhero age is now as much of a feat of athleticism as it is a feat of drama. Joivan Wade is no stranger to this, as he’s now playing former Teen Titan cyborg in the new TV show, which also stars Timothy Dalton, Matt Bomer and Brendan Fraser. Luckily, Wade is no stranger to keeping trim. 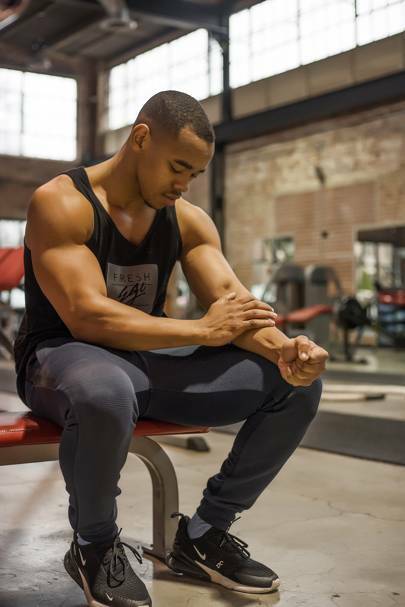 He used to play football – and wanted to go professional – until he went to the Brit School and would work on his fitness in the school gym instead. But it’s all gone into hyperdrive now that he’s a caped crusader. That being said, being bulky is great for Doom Patrol, but it might not be great for Wade’s other roles. Is it safe, I asked, to be oscillating wildly in muscle mass just for work? “If you have the right people around you you’re going to be OK,” he said, “but if not, yeah, it’s very dangerous.” Luckily Wade is not the kind to do things by halves: an entrepreneur, a performer and an athlete, I wanted to know how he manages to keep organised, jacked and learn all his lines at the same time. “Sunday is when I prep. We’ve got great catering on set, so I can get three-four meals a day, but when I’m training I eat five meals a day. So I meal prep usually a fish dish throughout the week that I can take out to accompany my meals. I just like to do as much of nothing as possible. Reset my mind. I have my businesses back in the UK that give me an opportunity to plug in and make sure everything is going all right back here and plug in with the team back home and let them know I’m still alive. I use that day to chill out, try and get as much as I can done, but mainly just resetting my mind and chilling. “I train five times a week, usually three-four times with my personal trainer. That’s an hour, hour and 15 minute session, depending on when I’m shooting. Usually I’m training in the morning before I go to work and if I’ve got a 5am call I’ll train at 3.30am or 4am or after I finish work and the schedule permits – three days a week with my trainer, two days with myself. Each day I’m training a different muscle group: Monday is back, Tuesday is chest, Wednesday legs, Thursday arms, Friday shoulders. Within that session I’m doing cardio as well as weight training. I’m trying to achieve muscle mass as well as staying lean. “If I’m scheduled to come in after breakfast, I won’t eat on set for a good six hours. I’ll need to eat something in the morning, then eat something in there. “Fridays we call ‘Fraturdays’ because we tend to start later on a Friday, which means that you still have to do the 16 hours: if you start at 5pm you’re not finishing until the 8am Saturday morning, then you go home and you sleep and by the time you wake up it’s 4pm and your Saturday is kinda gone. On a Fraturday, the fact that you’re doing one means we probably worked the Thursday late also. So they’ve pushed it, we can’t be called until 12 hours after wrap time. I might have got in at 3am that day, but still esentially get up after five hours to start my regime and my PT in to train in the morning. If I’ve gone to bed at 3am, I’ll be up at 8am and then I’ll train from 8-9am, go through my beats and study for that day and then go into work, but I’ll have hopefully prepped everything meals-wise on Sunday, otherwise I’m prepping before that. Because by the time we get in, I’ll have missed that breakfast opportunity and sometimes lunch as well. Doom Patrol is currently showing on DC’s Universe’s streaming platform in the US and will be arriving on a UK streaming service this summer.